What is so special about Py-Bo Natural Pyrethrum concentrate? 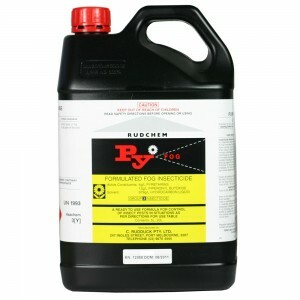 At 80 g/L pyrethrins and 480 g/L piperonyl butoxide (a 1:6 ratio), it is 20 times stronger than the 4 g/L products available in garden shops — and therefore much more economical to use. 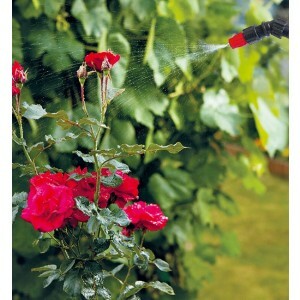 At about 20 times the concentration of home gardener products, the dilution rate is 1 ml to a litre of water, in other words, 1 litre makes 1000 litres of spray. What can Py-Bo Natural Pyrethrum be used for? Py-Bo Natural Pyrethrum concentrate is registered for use on all fruit and vegetable crops, cut flowers and ornamental plants. 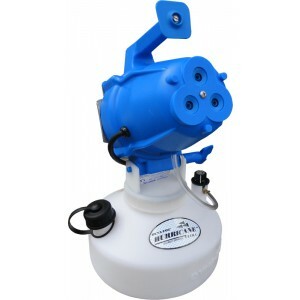 It can also be used outdoors to control adult mosquitoes, midges, flies and other flying insects. Py-Bo Natural Pyrethrum is also registered for use inside buildings including domestic premises, commercial, industrial and public buildings including: food processing establishments, shops, factories, hotels and motels, shipping containers, offices, schools, storerooms, warehouses, hospitals, barracks, private houses and external areas asscociated with such establishments. Agricultural buildings including storage sheds, milking sheds,other high density animal production sheds, barns, kennels and stables. 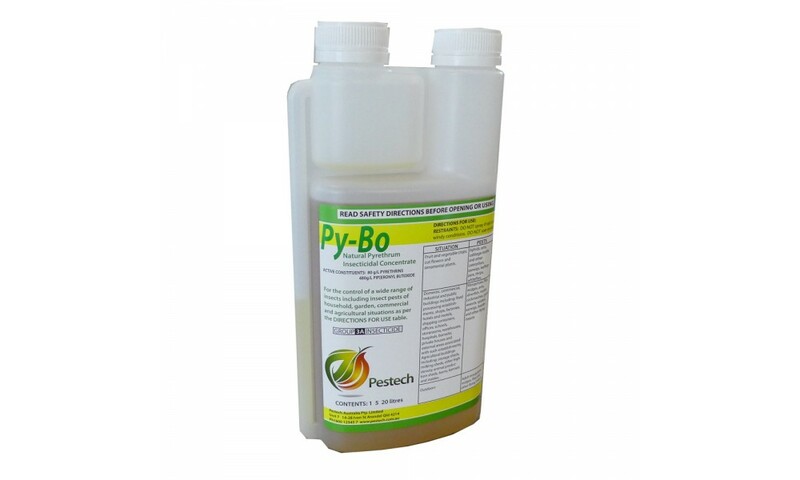 Py-Bo Natural Pyrethrum concentrate controls all aphids, all thrips, all caterpillars, all whiteflies, all leafhoppers ants and earwigs. 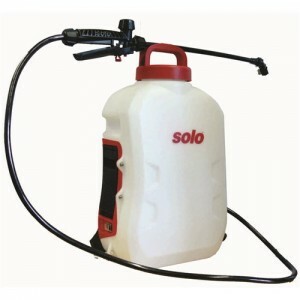 Compatible with fungicides and foliar fertilizers. Worker re-entry to crops as soon as droplets have settled. A long residue is of no advantage on plants anyway; new leaves appear every other day and few insects eat old leaves when new and tender shoots are available. Some growers of crops in protected facilities such as greenhouses, use pyrethrum to kill off the last of the pests before their old crop is removed. This significantly reduces the threat to the next crop, and, if they intend to introduce beneficial insects, there are no residues to affect their establishment. In a nutshell, if you have the equipment that can put a droplet or three on any insect in your crop — it will die within minutes. Natural pyrethrum will kill almost every insect it contacts. It kills within minutes so you can be sure it is doing the job you expect. It degrades in UV light so the withholding period is just 1 day. 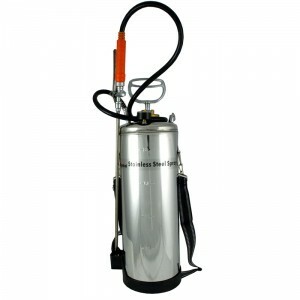 Because it is rapidly metabolised it can be used on all crops and inside food handling areas. Natural pyrethrum will rapidly degraded in mammals and birds and cannot build up to levels which lead to chronic poisoning symptoms. It is possible some people will have allergies and touching nasal passages and other sensitive skin with unwashed hands can lead to discomfort. There is no petroleum solvent in the formulation to cause leaf burn, however the only plants we know to be affected are continental or Lebanese cucumbers. 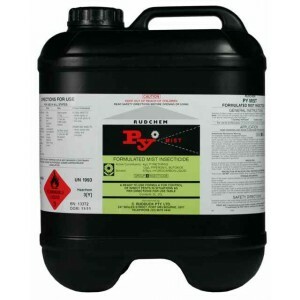 Py-Bo natural pyrethrum can be tank mixed with foliar fertilisers and fungicides. Wetters and stickers are not required; they just add to your expense for no benefit. For your first application. 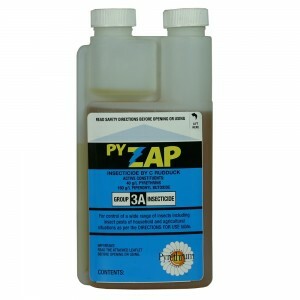 find a section of your crop or premises where there are active pests then, using your normal equipment and technique, apply the Py-Bo pyrethrum solution. Important: check the result within 15 minutes. If you find dead pests it is because they were contacted. 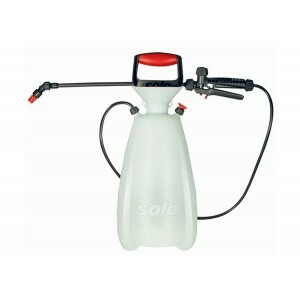 If there are live pests it is because they were not contacted so you need to change something physically; the droplet size (larger or smaller) or the angle of nozzles, or the volume of solution for the area. Try another section to assess the result of the changes you’ve made. Py-Bo Natural Pyrethrum can be used through misting and fogging machines to kill everything that flies in factories including of course, flies, fungus gnats, drosophila, wasps, etc.